Matrix metalloproteinase 12 (MMP12) is a proteolytic enzyme responsible for cleavage of plasminogen to angiotensin, which has an angiostatic effect. Using data from a population-based case–control study conducted among Chinese women in Shanghai, we evaluated the association of breast cancer risk and survival with two common polymorphisms in the MMP12 gene: A-82G in the promoter region and A1082G in exon, resulting in an amino acid change of asparagine to serine. Included in the study were 1,129 cases and 1,229 age-frequency-matched population controls. Breast cancer patients were followed up to determine the intervals of overall survival and disease-free survival. The frequencies of the G allele in the A-82G and A1082G polymorphism among controls were 0.029 and 0.107, respectively. There were no associations between MMP12 polymorphisms and breast cancer risk. Patients with the AG or GG genotype of the A1082G polymorphism showed poorer overall survival (though the difference was not statistically significant) than patients with the AA genotype (hazard ratio 1.36, 95% CI 0.92 to 2.00). This result suggests that MMP12 A1082G polymorphism may be related to prognosis in breast cancer patients. Additional studies with larger sample sizes are warranted. Matrix metalloproteinases (MMPs) are a family of zinc-dependent proteolytic enzymes that are involved in tumor angiogenesis, migration, and invasion as well as the regulation of immune surveillance [1, 2]. With a few exceptions, the expression and activity of MMPs are increased in almost every type of human cancer and are correlated with advanced tumor stage, increased invasion and metastasis, and shortened survival [2, 3]. In transplantation assays, relatively benign cancer cells acquire malignant properties when the expression of certain MMPs is up-regulated. Conversely, highly malignant cells become less aggressive when the expression or activity of certain MMPs is reduced . Substrates of MMP12 are various extracellular matrix and non-extracellular-matrix proteins . MMP12 may inhibit angiogenesis through cleavage of plasminogen and collagen XVIII, resulting in the generation of angiostatin and endostatin, which have an angiostatic effect [2, 5, 6]. On the other hand, MMP12 may promote angiogenesis by cleaving structural components of the extracellular matrix, such as collagen type IV and fibrin . It has been shown that increased expression of MMP12 may reflect a favorable prognosis in a few cancers . A-82G polymorphism is located on the promoter region of the MMP12 gene where the transcription factor activator protein 1 (AP1) binds. The A allele is associated with a higher binding affinity for AP1, resulting in higher MMP12 promoter activity in vitro . A study showed that the A allele was associated with smaller coronary artery luminal diameter in diabetic patients treated with percutaneous transluminal coronary angiography and stent implantation . In another study, however, no association was found with risk of coronary aneurysm . A1082G polymorphism is located on the coding region of the hemopexin domain that is responsible for MMP12 activity. The substitution of the G allele for the A allele results in an amino acid change from asparagine (Asn) to serine (Ser) in codon 357. The functional significance of this single nucleotide polymorphism, however, has not been clearly determined. In this study, we evaluated the association of these two common polymorphisms of the MMP12 gene with breast cancer risk and survival in the Shanghai Breast Cancer Study. Eligible controls were randomly selected from the Shanghai Resident Registry, which contains demographic information for all residents of urban Shanghai, and were frequency-matched on age by 5-year intervals to the predetermined age distribution of the cases reported to the Shanghai Cancer Registry from 1990 to 1993. Of the 1,734 eligible controls, 1,556 (90.3%) completed interviews. The major reasons for nonparticipation of the eligible controls were refusal (166 controls, 9.6%) or death or a prior cancer diagnosis (2 controls, 0.1%). The structured questionnaire used for this study included information on demographic factors, menstrual and reproductive history, hormone use, previous disease history, family history of cancer, physical activity, tobacco and alcohol use, and a quantitative food-frequency questionnaire. All participants were measured for current weight, circumferences of the waist and hips, and sitting and standing height. In addition to the in-person interviews and anthropometric measurement, 10 ml blood samples were collected from 1,193 (82%) cases and 1,310 (84%) controls. These samples were processed on the same day and stored at -70°C. Genomic DNA was extracted from buffy coat fractions using a Puregene® DNA Purification kit (Gentra Systems, Minneapolis, MN, USA) following the manufacturer's protocol. DNA concentration was measured by PicoGreen® dsDNA Quantitation Kit (Molecular Probes, Eugene, OR, USA). The allelic discrimination of the MMP12 gene A-82G and A1082G polymorphisms were assessed with the ABI PRISM 7900 Sequence Detection Systems (Applied Biosystems, Foster City, CA, USA), using the fluorogenic 5' nuclease assay with primers and probes obtained from ABI (Assay ID: C_15880589_10 and C_785907_10). PCR was performed in a total volume of 5 μl, which contained 2.5 ng DNA, 1 × TaqMan Universal PCR Master Mix, each primer at 900 nM, and each probe at 200 nM. The thermal cycling conditions were as follows: 95°C for 10 min to activate the AmpliTaq Gold enzyme, followed by 40 cycles of 92°C for 15s and 60°C for 1 min. The fluorescence level was measured with an ABI PRISM 7900HT Sequence Detector (Applied Biosystems), resulting in clear identification of three genotypes. The laboratory staff was blind to the identity of the subjects. Quality control samples were included in the genotyping assays. Each 384-well plate contained four water, eight CEPH 1347-02 DNA, eight blinded quality control samples, and eight unblinded quality control samples. The concordances for the blinded samples were 98% for A-82G and 100% for A1082G polymorphisms, respectively. Genotypes for polymorphisms of A-82G in the MMP12 gene were successfully determined for 1,118 cases and 1,223 controls and those of A1082G for 992 cases and 976 controls. The χ2 test and t-test were used for comparing characteristics of cases and controls. Minor genotypes AG or GG of A-82G and A1082G were combined in stratified analysis because of the small number of subjects in each category. Odds ratios and 95% confidence intervals (CIs) were derived using unconditional logistic regression models. To evaluate the association of MMP12 with survival, Cox proportional hazard models were applied after adjusting for age, TNM stages, and ER/PR status. The proportional hazard assumption of the Cox model was examined by graphic evaluation of Schoenfeld's residual plot. All P values presented in this paper are two-sided. SAS software was used for statistical analysis (version 9.1; SAS Institute, Cary, NC, USA). The distribution of demographic characteristics and known breast cancer risk factors of the cases and controls are presented in Table 1. Consistent with our previous reports [9, 11], reproductive risk factors such as early menarche, late menopause, and late age at the first live birth were related to increased breast cancer risk. Cases were also more likely than controls to have higher body mass index (BMI), waist-to-hip ratio, or history of breast fibroadenomas, and were less likely to have exercised regularly during the preceding 10 years. The case-control difference was not statistically significant in age and education. Comparisons of participants with MMP12 genotype information. aValues are presented as means ± standard deviations unless otherwise noted. bCalculated from the t-test for continuous variables and the χ2 test for categorical variables. cAmong postmenopausal women. dAmong parous women. The distributions of MMP12 A-82G and A1082G genotypes are shown in Table 2. In the controls, the genotype frequency of the A-82G polymorphism did not deviate from the Hardy–Weinberg equilibrium, but that of the A1082G genotype deviated marginally (P = 0.05). In the cases, the genotype frequencies of both polymorphisms deviated from the Hardy–Weinberg equilibrium; this deviation was not likely to have been due to a laboratory error, because the concordances for the quality-control samples were more than 98%. Small numbers of subjects in the GG genotypes of both polymorphisms would be a possible explanation for this deviation. The frequencies of the minor G allele of A-82G (0.029 for controls and 0.026 for cases) were substantially lower than those previously reported for Caucasian populations, which ranged from 0.11 to 0.19 [7, 8, 12, 13], whereas the minor allele frequencies of A1082G (0.107 for controls and 0.112 for cases) were higher than in one previous report of 0.05 . In agreement with an earlier report , we found that these two polymorphisms are not in linkage disequilibrium . aAdjusted for age, education, age at menarche, menopausal status, age at menopause, age at first live birth, waist-to-hip ratio, and physical activity during past 10 years. bAG/GG genotypes for A-82G and AG/GG genotype for A1082G polymorphisms. CI, confidence interval; OR, odds ratio. Overall, there were no associations of breast cancer risk with either A-82G or A1082G polymorphisms alone or in combination. The genotype association did not differ by age (<45 years vs ≥ 45 years old at the time of diagnosis), menopausal status, or family history of breast cancer (data not shown). The frequencies of minor genotypes of both polymorphisms were not significantly higher among patients with an advanced stage of breast cancer, nor did they differ by ER/PR status (Table 3). aAG/GG genotypes for A-82G and AG/GG genotype for A1082G polymorphisms. ER, estrogen receptor; PR, progesterone receptor; TNM, tumor, node, metastasis. The association of two polymorphisms of the MMP12 gene with breast cancer survival and disease-free survival are presented in Table 4 and Fig. 1. Patients who had the AG or GG genotypes of A1082G showed poorer overall survival than patients who had the AA genotype (hazard ratio (HR) 1.36, 95% CI 0.92 to 2.00). Compared with those who had only the AA genotypes in both A-82G and A1082G polymorphisms, patients who had one or more of the minor genotypes in these polymorphisms showed a poorer overall survival (HR 1.42, 95% CI 0.99 to 2.04). Our data did not suggest an association between MMP12 gene polymorphisms and disease-free survival. aAdjusted for age, TNM stage, and ER/PR status. bAG/GG genotypes for A-82G and AG/GG genotype for A1082G polymorphisms. CI, confidence interval; ER, estrogen receptor; HR = hazard ratio; PR, progesterone receptor; TNM, tumor, node, metastasis. Overall survival among breast cancer patients analyzed according to A1082G polymorphism and combined A-82G and A1082G polymorphisms of the MMP12 gene and P values for survival curves derived using a log-rank test. (a) Patients carrying the AG or GG genotypes at the A1082G polymorphism had a lower overall survival rate than those who had the AA genotype. (b) Patients carrying either of the minor genotypes (AG or GG) in either A-82G or A1082G polymorphisms had a lower overall survival rate than those who had the AA genotype for both A-82G and A1082G polymorphisms. This study suggests that two common polymorphisms (A-82G and A1082G) of the MMP12 gene may not be related to breast cancer risk. The A1082G polymorphism, however, may be associated with the prognosis for breast cancer patients. 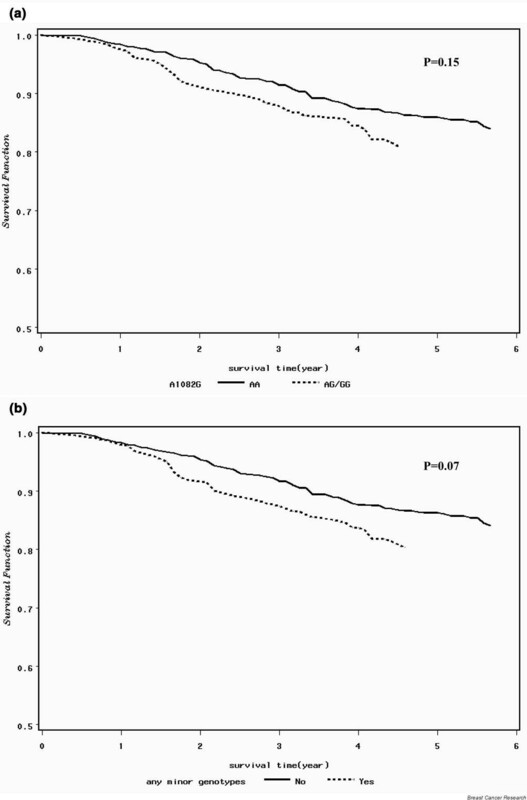 The association with survival seems to be independent of other clinical prognostic factors such as cancer stage or ER/PR status. Yang and colleagues reported that overexpression of MMP12 in tumors correlated with increased survival and decreased tumor neovascularization in colorectal cancer patients . Similarly, Kerkelä and colleagues reported that MMP12 expressed in macrophages in the tumor site correlated with well-differentiated cancer cells . MMP12 is expressed in breast tissue and may exert its protective effect through the cleavage of plasminogen to angiostatin and of collagen XVIII to endostatin [17–19]. In addition, MMP12 is also involved in the cleavage of domain D1 of urokinase-type plasminogen activator cellular receptor, which is responsible for cell migration during tumor invasion and angiogenesis . The A-82G polymorphic site is the binding site of AP1, and the A allele is related to increased MMP12 activity [3, 7]. Given the functional significance of this single nucleotide polymorphism and the role of MMP12 in breast carcinogenesis, we hypothesized that this single nucleotide polymorphism may be related to breast cancer risk and survival. Our findings, however, do not support this hypothesis. The much lower frequency of the minor G allele in our study population than in Caucasian populations [7, 8, 12, 13] substantially reduces the statistical power. Indeed, we had only 51% power to detect 30% decreased risk of AG or GG genotypes, assuming a type I error of 0.05 . A1082G polymorphism of the MMP12 gene results in a substitution of amino acid Ser for Asn in codon 357. The function of this polymorphism has not yet been determined; however, the substitution of a hydroxylic amino acid (Ser) for an acidic amino acid (Asn) may affect the activity of the enzyme . In our study, the AG or GG genotypes of A1082G polymorphism were associated with poor prognosis of breast cancer patients. This result was prominent only in overall survival, but not in disease-free survival. The information on overall survival, however, is likely to be more accurate than that on disease-free survival, because information on disease progress and recurrence was collected by interviews with patients, or kin of deceased patients, rather than by reviewing medical records. Further evaluation of this association in other populations is required. Our study has several strengths. First, the population-based study design and the high participation rate minimize potential selection bias. Second, the homogeneous ethnicity of this population (Han Chinese) minimizes possible population stratification . Third, including comprehensive lifestyle and clinical information makes it possible to consider potential confounding and interactive effects in data analysis. Our study suggests breast cancer risk may not be associated with the A-82G and A1082G polymorphisms in the MMP12 gene. The minor G allele in the A1082G polymorphism, however, may be related to poorer prognosis for breast cancer patients. This is the first report on the association of the MMP12 gene polymorphism with breast cancer risk and survival, and the results need to be confirmed in other large-scale studies. The authors wish to thank Drs Qi Dai, Fan Jin, and Jia-Rong Cheng for their contributions in coordinating data and specimen collection in Shanghai and Ms Bethanie Hull for technical assistance in the preparation of this manuscript. This study would not have been possible without the support of all of the study participants and research staff of the Shanghai Breast Cancer Study. This study was supported by research grants RO1CA64277 and RO1CA90899 from the National Cancer Institute. AS and WZ conducted data analysis and drafted the manuscript. All authors contributed to result interpretation and manuscript revision. QC performed lab assays. X-OS, Y-TG, and WZ designed the study, recruited subjects, and collected data and biological samples. WZ was the principal investigator of the study and secured the research funding. All authors read and approved the final manuscript.